The concept for our Triple IPAs was born in the hop fields of the Willamette Valley of Oregon. I was a guest of our friends at Willamette Valley Hops, and had the privilege to watch acres of hops being harvested and picked. It was truly incredible, but the most memorable part of the whole experience was the intoxicating smell of hops pouring out of the buildings that held the drying floors. It was olfactory overload, a smell so saturated and pungent, it was hard to describe other than it smelled like awesomeness. Later, as we were having a BBQ at their office, I told Bruce and Paul that I wanted to create a beer that embodied that experience. When I got back from Oregon, I tried to describe the smell that almost short circuited my nose, and we brainstormed on how we could create a beer that embodied that. It quickly became apparent that the only real answer to the question, “How do we bring that intensity to a beer?” was to take the wisdom of Nigel Tufnel, and turn it all the way up to 11. We were going to make triple IPAs. The rationale for this was more than just that these beers should be big. The higher alcohol content extracts and holds the principal source of the aroma and flavors of hops – the volatile oils – more effectively during dry hopping. The beer then releases those oils as it is poured into the glass, creating that blast of hoppiness we were looking for when the drinker went to take a sip. To create this intensity, we knew we would have to be more aggressive than we had ever been when it came to how many pounds of hops to add to the beer, while being careful to avoid getting a muddled aroma or flavor by blending in too many hop varieties. Instead we decided to focus on less hop varieties, but to select those that were known not just for their high oil content and intensity, but also their balance between lighter fruity notes, and darker, richer aromas. We settled on Galaxy and Vic Secret from Australia, and Citra from the US, to be the cornerstone of these beers. Finally, despite how big they were going to be, and how intense we were looking to make these beers, we did not want to fall into the trap of taking them too seriously. We are firm believers that beer is meant to be fun, something to share with others and have a good time. We wanted the soul of these beers to be about that – shockingly easy and fun to drink and enjoy with friends. 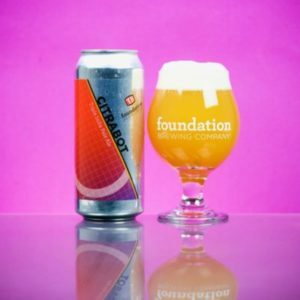 The concept of these beers being something that should be fun, and with the aggressiveness and intensity hidden in plain sight, brought us back to something from our childhoods, Transformers. So, in tribute, we decided to make not just one beer, but two. Viewed as opposing forces, Galacticon with its dominance on the darker flavors of Galaxy hops, and Citrabot with most of its power derived from the lighter, brighter flavors of Citra, would duel against each other for eternity! Yeah, it is pretty geeky, but we think the beers are great, and a ton of fun. We hope you do too!